Vote Audrey: On rationale and the spilling of dairy products. 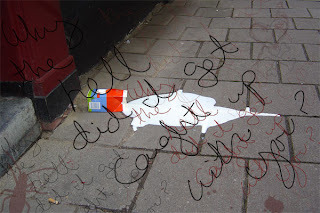 On rationale and the spilling of dairy products. I'd like to think I'm over my recent milk-splattering-not-earth-shattering parting of relational ways, but here I am doodling. One can only ponder what Freud would say. (Background image, courtesy Luw Swift; doodles, moi). Love it Audrey - what app are you using? Is it just Photoshop, or something else? Hey Will! For this, I used primarily Photoshop, but wrote the text in Illustrator (to layer it as a vector over the other elements in Photoshop). PS-for some quirky reason, I can't comment on your blog. I go and read it and have some clever response, but no luck! I keep meaning to talk about this on Facebook but I've been lazy.